Back in Austin after a wet weekend in Waco, Texas scored a two-run win over Rice on Tuesday night. 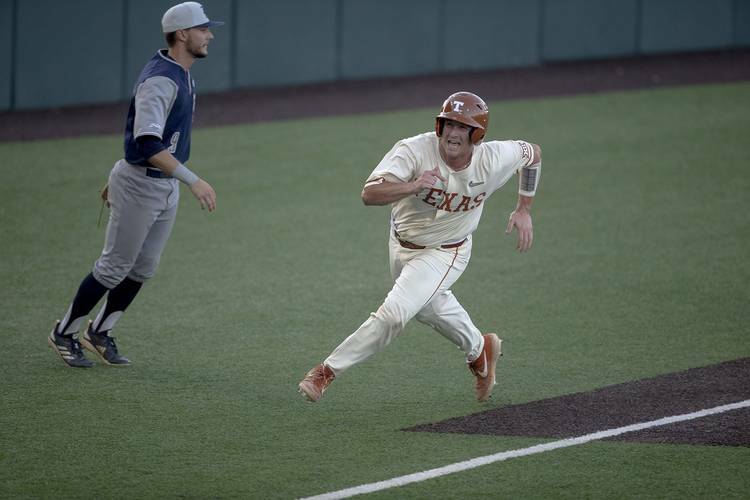 After Texas outfielder Austin Todd drove in the first run at UFCU Disch-Falk Field with a first-inning single, Texas and Rice traded runs in the third inning. Texas accounted for its final run when Duke Ellis scored as Rice turned a double play in the sixth session. Senior reliever Matteo Bocchi was credited with the win on Tuesday. It was Bocchi’s first pitching decision since UT beat Tennessee Tech (and current Rice coach Matt Bragga) last June in the decisive game of a NCAA super regional. Over Bocchi’s three hitless innings, the Owls only reached base on an error and hit batter. The victory was UT’s second against Rice this season. The No. 14 Longhorns are now 22-13. Rice’s record dropped to 14-21. Calvin Anderson joined Texas’ football team as a graduate transfer this past season, but it appears that he still has fond feelings for Rice. A left tackle, Anderson started in 50 straight games over the last four years at Rice and Texas. Earlier this week, Anderson was sent to Tampa Bay in a mock draft produced by The Athletic. NOTABLE NUMBER: 3. On the first pitch thrown to a Longhorn on Tuesday, Ellis tripled to left field. The triple was UT’s sixth of the season but third in two games against Rice. Entering Tuesday’s game, UT’s five triples ranked 184th nationally and last in the Big 12. Last season, only eight teams had more than the 22 triples produced by Texas. UP NEXT: Kansas State (13-20; 1-5 Big 12) will be UT’s guest at UFCU Disch-Falk Field this weekend. The Longhorns’ two stumbles in Manhattan were two of the more surprising losses on last year’s resume. Texas, which is 4-4 in conference play, last lost to Kansas State in Austin in 2013.